Mr.S.Punithan, Madhu division political head also participated in the discussion with members of the SLMM in Mannar district, sources said. 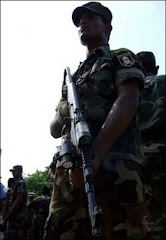 The discussion which was to commence at about 9.30 a.m. Wednesday at Karukkaikulam located was delayed more than an hour as the soldiers of the SLA manning the sentry point at Uyilankulam did not allow the SLMM delegation to enter the LTTE area. They were allowed at around 10.30 a.m. to meet the LTTE at Karukkaikulam, sources said. LTTE delegation brought to the notice of the SLMM the attack made DPU of the SLA on Tuesday evening in which a woman was killed, sources said. LTTE Mannar leaders pointed out to the SLMM that the SLA is conducting clandestine attacks even in sacred areas such as Madhu, sources said.